The online article states "Demand is fierce in communities that have the right mix of good schools, short commute times, fun and walkable downtowns, and lots of new, spacious homes." 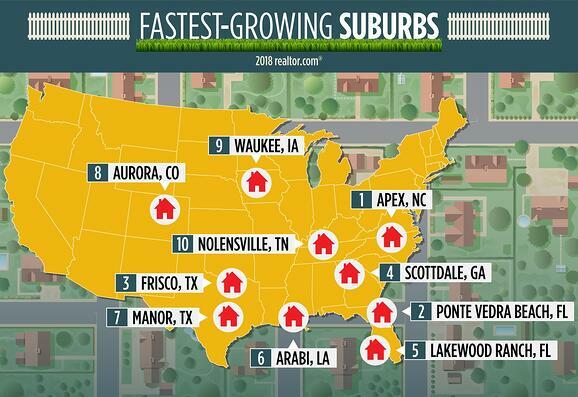 Realtor.com also applauds the Top 10 Communities on "chasing" the growth they want to see and facilitating it by implementing "developed downtowns and city-like amenities." Nocatee's Splash Waterpark is mentioned in the article as one of the many perks about moving to the 32081 zip code of Ponte Vedra, but amenities aren't the only thing attracting people of all ages to Nocatee. Many families choose to move to because of the outstanding schools, which is a big draw for a lot retirees to be closer to their grandchildren. 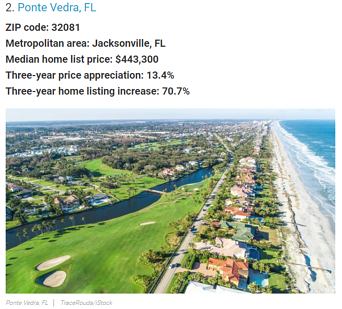 Realtor.com also acknowledges the vast diversity of home styles and price points in the area, confirming that Nocatee has a home for everyone to enjoy. To read the full article, visit Realtor.com.